11:20 p.m.: Casey Cagle and Brian Kemp will face each other in a July runoff for the Republican spot for governor following tonight’s primary election. The winner takes on Democrat Stacey Abrams, who could become the first woman, and the first African American, to ever hold the top political seat in Georgia. Cagle led the pack of GOP candidates from start to finish as results came in, while Kemp easily held off Hunter Hill for second place. Abrams, meanwhile, stormed out to a huge lead over her opponent, Stacey Evans, and never looked back. The results in the governors races weren’t much of a surprise, but there were several unexpected finishes. In the Republican race for Secretary of State, Josh McKoon faltered. Meanwhile, other candidates for office secured enough votes to avoid a runoff. We’ll analyze the numbers up and down the ballot and look ahead to the next election on Political Rewind with Bill Nigut at 2 p.m. on GPB Radio and on the GPB News Facebook Page. 11:13 p.m.: In his speech to supporters, Secretary of State Brian Kemp wastes no time attacking Lt. Gov. Casey Cagle, calling his fundraising efforts a "dark-money super PAC." A chorus of "boo" rings out after Kemp says, "He attacked every candidate in the governor's race after saying for months he wanted a clean race." Secretary of State Brian Kemp addresses his supporters during the primary election watch party May 22. 11:09 p.m.: With 87 percent of the votes counted in the Democratic race for superintendent of education, Former National PTA President Otha Thornton ( at 44 percent) and former Georgia Association of Educators President Sid Chapman (at 36 percent) appear headed for a runoff. 10:55 p.m.: Lt. Gov. Casey Cagel addresses his supporters at his campaign watch party, saying "It is great to come in first place." Lt. Gov. Casey Cagle addresses supporters during the May 22 primary. 10:45 p.m.: Stacey Abrams addresses her supporters to say she intends to repeal campus carry and expand HOPE. "We can lead a stonger Georgia," Abrams says. "We can show the old guard something new." Stacey Abrams addresses her supporters May 22. 10:30 p.m.: In the Republican race for insurance commissioner, Jim Beck moves toward securing the nomination without a runoff. He currently leads the competition with 60 percent of the vote with 75 percent of precincts reporting. On the Democratic side, Janice Laws has a solid lead with 64 percent of the vote over Cindy Zeldin. 10:25 p.m.: The AP calls the July 24 gubernatorial runoff between Lt. Gov. Casey Cagle and Secretary of State Brian Kemp. 10:20 p.m.: “We are writing the next chapter of Georgia history, where no one is unseen, no one is unheard and no one is uninspired,” Stacey Abrams says in her victory speech. 10:16 p.m.: With 68 percent of precincts reporting in the Republican race for Lieutenant Governor, State Sen. David Shafer is edging closer to securing the nomination without a runoff. He currently has 48 percent of the vote. Richard Woods is well ahead of his opponent in the state school superintendent race. Screen grab taken at 10:16 p.m. from Secretary of State website. 9:52 p.m.: Incumbent Jody Hice leads his two opponents in the Republican race for Congress District 10. With 44 percent of the votes tallied, he stands at 79 percent. On the Democratic side, Tabitha A. Johnson-Green leads her two opponents with 56 percent of the vote. 9:44 p.m.: With 51 percent of all precincts reporting in the Democratic race for Lieutenant Governor, businesswoman Sarah Riggs Amico leads non-profit founder Triana Arnold James 56 to 44 percent. 9:32 p.m.: The Republican race for State School Superintendent pits incumbent Richard Woods against his predecessor, John Barge. With 43 percent of precincts reporting, Woods holds a 61 to 39 percent lead. 9:30 p.m.: The Associated Press reports Stacey Abrams has won the Democratic primary race. If you’d like more context on tonight’s elections, listen to today’s thoughtful discussion with Bill Nigut and the Political Rewind panel. Find it here, and you can tune in to GPB radio tomorrow at 2 for more expert analysis of the results. 9:19 p.m.: Stacey Evans called Stacey Abrams to concede, Atlanta Journal-Constitution reporter Greg Bluestein said. Screen grab from Secretary of State website at 9:20 p.m.
8:58 p.m.: Now, with 18 percent of precincts reporting in the Democratic race for Secretary of State, former 12th District Congressman John Barrow is currently in a position to avoid a runoff at 52 percent. 8:51 p.m.: With 12 percent of precincts reporting in the Republican race for Secretary of State, businessman Brad Raffensperger leads with 34 percent over former Alpharetta mayor David Belle Isle who stands at 29 percent, State Sen. Josh McKoon at 21 percent and State Rep. Buzz Brockway at 16 percent. 8:44 p.m.: With 12 percent of precincts reporting in the Republican race for Lieutenant Governor, State Senator David Shafer holds a commanding lead at 46 percent. If he can top 50 percent, he will avoid a runoff. 8:35 p.m.: With 8 percent of precincts reporting, Cagle leads at 41 percent, with Kemp at 26 percent and Hill following at 17 percent. For the Democratic side, Abrams is ahead of Evans 71 percent to 29 percent. 8:30 p.m.: Sen. Josh McKoon is in third place in the GOP race for Secretary of State. 7:55 p.m. On the Democratic side, Stacey Abrams is at 70 percent. Only 1 percent of all precincts have reported. Screen grab captured at 7:55 p.m. from Secretary of State website. 7:30 p.m.: Early results come in showing Cagle with a strong lead. This screen grab captured at 7:45 p.m. May 22. UPDATE 7 p.m.: Polls are closed in Georgia. The polls are closed. Start counting, people. 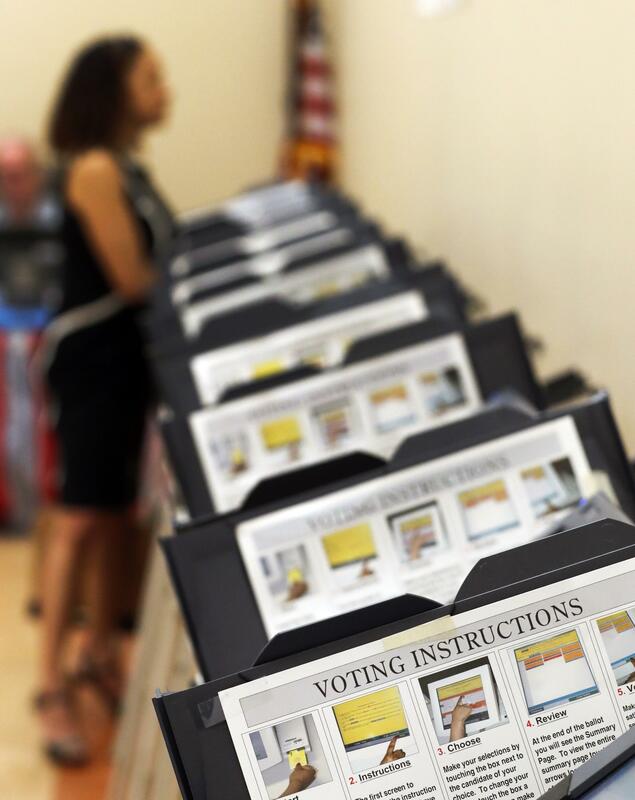 As the polls opened Tuesday, GPB reporters took to local polling stations. Term-limited Gov. Nathan Deal, a Republican, is unable to run and five Republican and two Democrat candidates are seeking to replace him. Lt. Gov. Casey Cagle is the front-runner, but a July 24 runoff is expected. The likely challengers are Secretary of State, Brian Kemp, and former State Senator Hunter Hill. 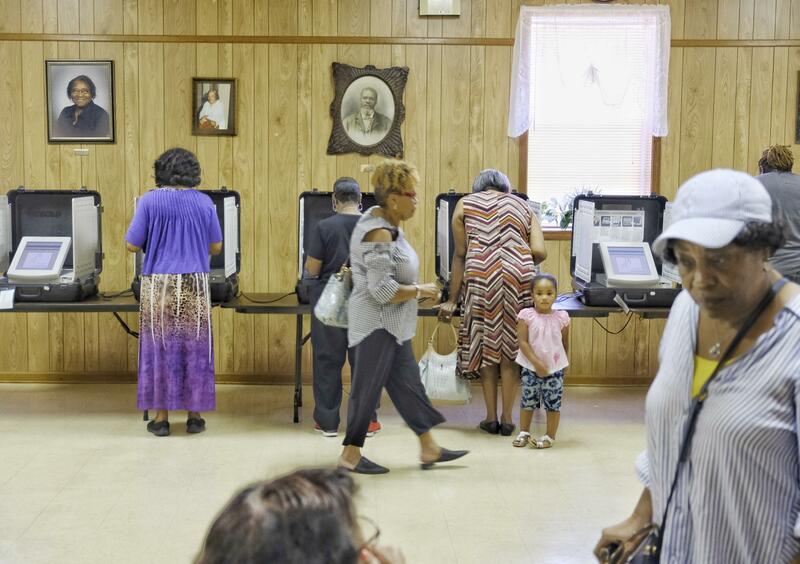 In Macon, 300 people cast ballots at two polling stations by 11 a.m.
At the East Macon 4 Voting Precinct at New Griswoldville Baptist Church, 130 people cast ballots by 11 a.m. The New Griswoldville Baptist Church in Macon said 130 people had voted by 11 a.m. and about 170 people cast ballots at the North Macon Park voting precinct by 11 a.m. Voters in Buckhead told GPB News why they chose their candidates. Votes at the Trinity Presbyterian Church in Buckhead tell GPB News why they chose their candidates and what issues most mattered to them. One voter, who identified gun control as an important issue, said she felt frustrated by having to vote for incumbents. "I wanted to vote for people who have not necessarily been in office. I think people can hold office for way too long so I think term limits are really important." Others cite issues including government waste, taxes, foster care, women's rights and education as crucial to their decisions.